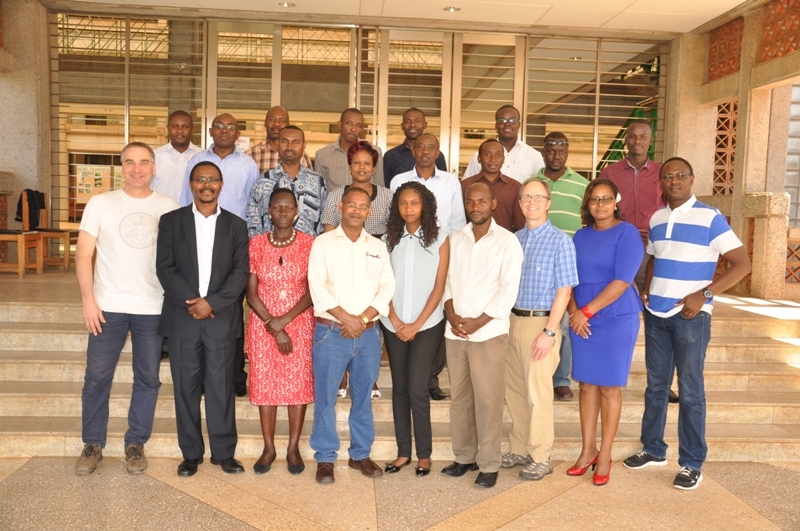 The latest CCRP “Open Source GIS and Tools” Workshop took place from March 20-24th at the African Institute for Capacity Development (AICAD) in Juja town, about 33 km NE of Nairobi. 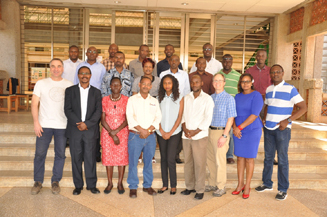 The group of 19 participants included the Kenya GIS team, representatives of the CCRP GIS support teams from Uganda and Ethiopia, and University partners from 4 Kenyan Universities and their attached students. The CCRP GIS support team consisting of Karsten Vennemann and Matt Stevenson had prepared a week long schedule covering a variety of topics with the goal of capacity building within the East African regional GIS support teams. The workshop included lectures and hands on exercises enabling the participants to publish their own interactive web maps, covered QGIS Cartography about ‘how to make better maps’, introduced tools that enable a wealth of spatial functionality using the desktop program QGIS, and finally introduced templates for creating simple maps and graphs by using the statistical software R. One day of the workshop week was dedicated to group work on creating a guide for CCRP researchers on “how to use GIS, spatial tools and analysis” in support of their scientific work and hypothesis. The resulting guide will be refined in collaboration with the research methods team and will be shared with researchers throughout CCRP. 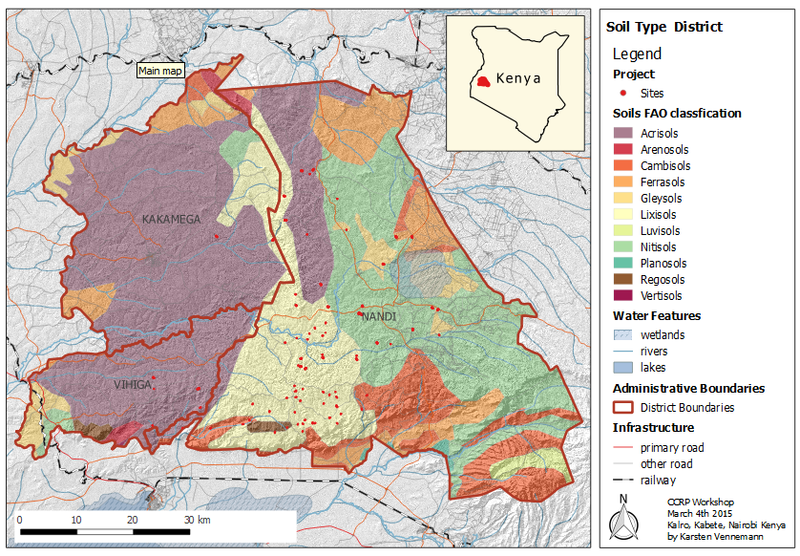 The goal of this guide along with the increased GIS support capacity in the region is to enable CCRP researchers to include spatial knowledge and analysis in their research approaches in order to create better results efficiently. 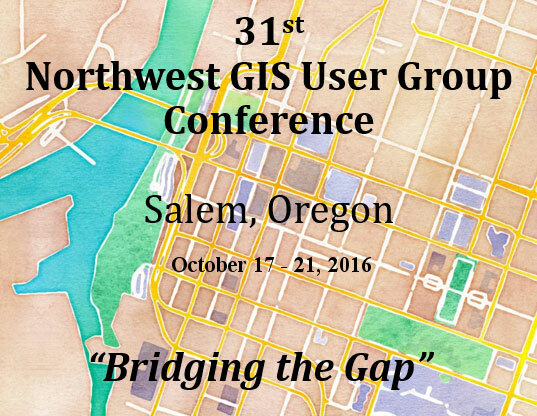 Terra GIS is offering a 2 day hands-on pre-conference workshop “Interoperable Web GIS Solutions with Free & Open Source Geospatial Software” at the NWGIS 2016 Conference – Bridging the Gap. The conference this year will be held at the Salem Convention Center, Salem, Oregon. The pre-conference workshop will be held on Monday October 17th and Tuesday October 18th, 2016, the main conference program will continue until Friday of the same week. Details about the workshop are here and the official conference workshop and registration page is here. At the end of May Terra GIS is offering a 2 day class on QGIS Desktop GIS at the Impact HUB, Seattle, Washington. The class will focus on practical exercises in a workshop style setting. 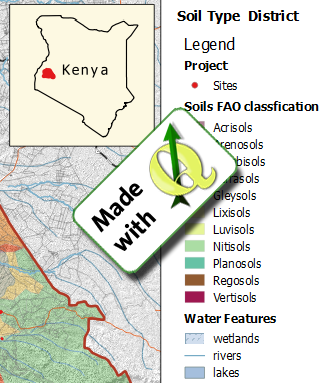 The class will enable ArcGIS users to easily transition to using QGIS and its comprehensive tool kit (or to use it in addition to their existing GIS software). Participants can choose to attend the full two day class or optionally attend only one of the two days. Details about the class can to be found here.